4 Most Frequently Asked Questions About Sedation Dentistry! Dentistry today is so much easier than it used to be. Not even 100 years ago, patients had no preventative care and not much restorative care, which meant that teeth were often pulled instead of being saved. What’s worse is that patients didn’t have many anesthetic or sedation options, so they had to undergo dental work without much pain management. Thankfully, patients today have sedation dentistry, which allows them to get the dental care they need without any fear, pain or anxiety. If you think you can benefit from sedation, you might have a few questions first. Keep reading for answers to the 4 most frequently-asked-questions below! Yes – sedation has been used for many years with great safety and success. Dentists are well-trained to thoroughly review each patient’s medical history to make sure that sedation is safe for them. In addition, you’ll have your blood pressure and heart rate taken both before and after the procedure to make sure it’s in a healthy range. Your dentist and their staff will also be closely monitoring you to make sure you’re safe throughout your visit. Are There Different Sedation Options? 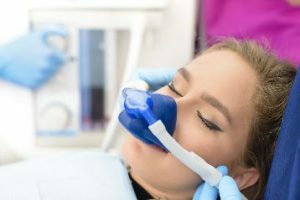 Nitrous oxide – Also called “laughing gas,” this type of sedation is delivered through a comfortable nosepiece, through which patients breathe an odorless gas. Nitrous oxide is very calming, so it gives patients the feeling that they don’t have a care in the world. Oral sedation – This type of sedation refers to a prescription medication that patients take at home, prior to their visit. It induces a deep feeling of calm and relaxation, and an added bonus is that it many patients will have no memory of their dental work. However, it does require that they have someone drive them to and from their appointment because its effects are longer-lasting. These options can be used by themselves or in conjunction to meet the unique needs of any patient. This depends on the type of sedation being used. One advantage of nitrous oxide is that its effects are felt almost immediately, but subside within minutes. This is ideal for people who need to get back to their busy day after a dental appointment. With oral sedation, it depends on the dose and medical history for each patient. A good ballpark estimate is 2-4 hours, but it can be much shorter or longer depending on a variety of factors. Your dentist will take these factors into account when prescribing the medication and will recommend that you take the day off from work or school to allow your sedation to completely wear off. In most cases, sedation won’t be covered by insurance. However, it’s always a good idea to discuss this with your dentist, who can help you determine your specific insurance benefits. Sedation is a wonderful option for any patient who finds it difficult to get the dental care they need because of fear or anxiety. It makes having great oral health so much easier than it was in the past – and that’s something to smile about! With decades’ of experience providing sedation, Dr. David Tripulas is an expert at helping each patient feel calm and comfortable in the dental chair. If you think you could benefit from sedation dentistry and have additional questions, he can be reached via his website or at (979) 532-4663. Comments Off on 4 Most Frequently Asked Questions About Sedation Dentistry!